Our immigration agencies often use language to obscure the true meaning of something, as my colleague Jon Feere reported recently. An example of his concern is the use of this oft-repeated line: "DACA is for children brought here through no fault of their own." In reality, as Feere pointed out, "DACA isn't just for 'children' and the program doesn't require that illegal aliens prove they were brought here" as opposed to arriving illegally on their own. Similarly, low-wage, nearly indentured foreign laborers are often called "guestworkers", giving the false impression that they are treated nicely, as one would treat a guest in one's home — and that they will leave at some point. But sometimes the mauling of the language has no policy overtones and is just a bureaucratic habit. That leads me to the answer to the question in the headline: When is a boat not a boat? The answer is: "When the boat is owned by the Border Patrol." That agency recently sent out a press release proclaiming that it had "received its tenth operational Riverine Shallow Draft Vessel" or RSDV for short. These are modest, 21-foot-long boats propelled like jet skis, which allows them "to operate in shallow rivers and lake areas ... and safely transit areas containing rocks, gravel, logs, sandbars, and vegetation." Let's ignore the extraneous word "operational" above — we assume that the BP does not pay for boats that sink — and let's not dwell on its use "in lake areas" as opposed to "in lakes" and just congratulate the Patrol on making a four-letter word, "boat", into a four-word title. 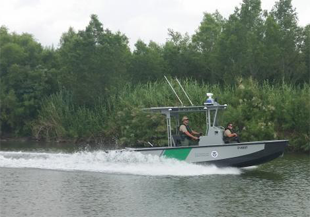 Although I do not applaud the language used, I do think that these boats should be useful, particularly on the Rio Grande, and they are a relatively inexpensive addition to the Patrol's growing collection of drones, helicopters, and fixed-wing aircraft. A set of 33 more RSDVs has been ordered and will arrive in the next two years. The most recent one will "be based out of Laredo, Texas".